With so many options out there, it can be very time consuming to find a tool box that is best suited for your truck. Various truck tool boxes are made of different materials such as stainless steel and aluminum. Some are polished and you have the option to customize the style for your truck. •	Ease of opening and secure closing. •	Cargo capacity needs to be adequate. •	Box and lid should be fully wielded for rigidity and strength. •	A low profile lid to avoid driver view obstruction. •	Additional strength in structure and bulb weather seal for protection against water damage and dirt. Typically, truck tool boxes are made in size classes depending on the class of truck that you drive. Check the internal dimensions of the truck bed to make sure it will fit. This ensures that you do not end up with a tool box hanging off the sides. The measurements you should take for the tool box for your truck bed are; the bed wall height, distance between inside of bed rails, distance between the outside of the bed-rails and the distance between the base of wheel wells and bulkhead. Think about how much capacity you will need. You will require a larger box if you usually take big cargo and larger power tools. 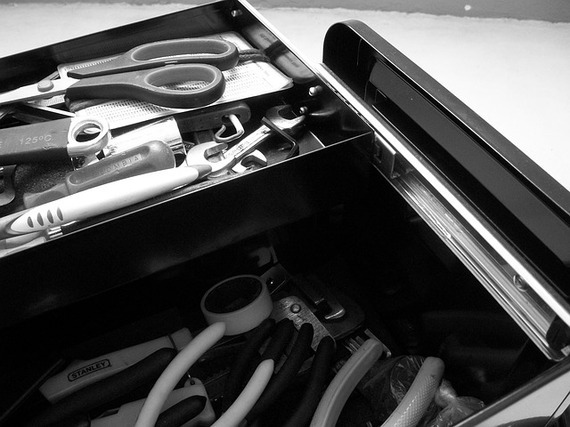 Opt for a narrower tool box if you need easy access to small tools. If your truck bed will be regularly occupied, a side mount tool box will provide easy access to your gear and minimize need for stretching too much when reaching for your tools. They are the most common type of truck tool boxes. The crossover tool box are mounted against the back of your truck and rest on the bed rails. They come in various sizes and styles. Crossover tool boxes are usually made with a single lid that opens back and others are designed with two doors to open at the center. This helps split the lid weight to easily open and close. When your truck bed is full of gear, having a crossover tool box will not be an ideal choice. The gear that is at the center of the crossover box will be hard to reach. This is where the side mount comes in and it is installed at the sides of the truck bed providing easy access. They can be designed to be long to fit longer equipment. They are great for adding extra storage. They come in different makes such as the stand alone tool chest, a trapezoidal box ideal for trailers and one that can be mounted behind the wheel wells for more storage. Before deciding on which tool box to go for your truck, look at vehicle specifications and also review usage needs. Adeyemi Adetilewa is an entrepreneur and professional content marketer who writes about business, entrepreneurship, life hacks and everything in between. You can checkout his recommended business resources for free.